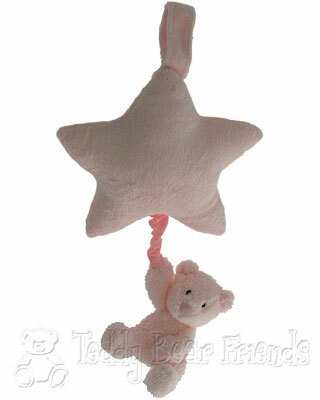 A sweet baby bear dangles from a soft pink star as a musical melody plays to send your little baby girl to sleep. The Jellykitten baby range from Jellycat are beautifully designed musical baby toys of the highest quality. This pink pull musical comprises a little teddy bear with baby-safe stitched eyes and features and a plush pink star. Pull on the little teddy bear to play a musical lullaby. A beautiful first gift for a new baby girl.